Welcome to Literacy through Classics in the primary Classroom. The resources on this website relate to ancient languages and cultures, and have been designed for primary school age children by Classics staff and students at Swansea University, in collaboration with the Iris Project. We have run a schools' project through which students teach primary school pupils since 2012, and since then more than 200 students, 1,200 pupils, and 20 schools have taken part. You can find out everything about our ongoing project on the About page. The resources from this project are freely available for anyone wishing to teach or learn about ancient cultures and/or languages at primary school level (though all information on this website remains the creative property of Swansea University). In our courses, we don't teach with a course book, but rather through storytelling, activities, and games. The improvement of linguistic and cultural literacy is the key aim of every lesson. You can find out more about our methodology here. Teachers may either use these resources as a course (we work with chapters, like a course book), or they can also be used to complement existing course books or curricula. ​What can you find on this website? We offer a course on primary Latin, both at Key Stage 1 (5 lessons) and Key Stage 2 level (27 lessons). Resources may particularly complement the most popular course books in the UK, Minimus and Telling Tales in Latin. 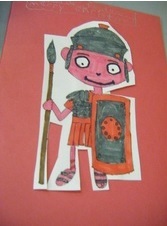 Our Ancient History resources tie in with the Key Stage 2 History curriculum on the Romans in Year 3/4. The ancient Greek course also follows the Key Stage 2 curriculum, and may particularly complement primary course books such as Mikromus and Telling Tales in Greek (both forthcoming). On the blog, you can find testimonials by students who are teaching the various classes, on their experiences and ideas. The gallery holds images from previous classes taught by our students. If you would like any help with any aspects of the teaching, please contact us, and we will be very happy to advise and support. Please note that this site has been developed largely by students. Every effort has been made to ensure accuracy and appropriate use of images and texts; however, if any typos or other issues remain, please do make us aware of them. This is also very much still a work in progress, and hence some lesson plans are more finished than others. If you are teaching Classics in Wales, please have a look at the Cymru Wales Classics Hub. This is an organisation which promotes and supports the teaching and learning of Classical subjects in Wales, particularly through the organisation of teacher training, conferences, inset days, and other events. We have a mailing list which we use to share information with our members. Enjoy your study of the ancient world!